Cripple Billy, orphaned since birth, just might have found a way off the Isle of Aran and a route all the way to Hollywood if he can persuade a small community of Islanders how much he wants to realise his dream. Martin McDonagh’s comic masterpiece examines an ordinary coming of age in extraordinary circumstances and confirms his position as one of the most original Irish voices to emerge in the second half of the twentieth century. I will freely admit that, despite having read the play while I was at university (thanks to a friend raving about its links to the “Man of Aran” filming) and being completely intrigued by a script that I’ve never been able to decide whether to take completely seriously (given the level of “Irish caricature” it contains), I probably wouldn’t have realised it was on at all if it hadn’t been for the fact that Daniel Radcliffe was taking the leading role. Which, if I’m honest, made me slightly sceptical as to whether there was any point in seeing it. After all, “Crippled Billy” was far removed from the other role Daniel has taken. I was unconvinced that he could pull it off and very worried he’d been cast simply to get people in the seats. The cover of the programme and the posters advertising it did seem to be pushing that impression at any rate. I’m very happy to say that I was completely wrong. Daniel was absolutely superb. It was Billy, not Daniel, who shuffled on stage five minutes into the opening scene and Billy he remained; there was certainly no hint of Harry Potter in the performance. A performance which, as some of the critics have already said, was understated, sympathetic and very, very real. And I discovered that Daniel also has a rather lovely singing voice – who knew?!? Actually, I can’t think of anything about the production that I didn’t like. The staging was excellent, the background music and the revolving set worked brilliantly, and the entire cast were fantastic. I was gripped from the instant the curtain rose and the sounds of sea breaking on rocks whooshed through the theatre and swept me away to a different time and place. Thankfully my fears that my hearing problems would mean I struggled with the accents were groundless, after a moment or two to adjust to the flow and rhythm of their voices I was absolutely fine – the acoustics in the Noel Coward Theatre are excellent. I must admit that I still haven’t worked out how much of the play is designed to make a mockery of the rest of the world’s views of the Irish and how much is supposed to be taken literally but I think that was rather the point of the play, to make you question your assumptions, your motives and your thoughts. But it also made me laugh, brought a tear to my eye a couple of times and left me uplifted but with a profound sense of sadness for Billy and his future. If you do have time – and there are any tickets left, there wasn’t an empty seat in the house when I saw it last Monday night – then do go and see this. Not only is the script brilliant but the production levels and casting are a triumph. I’d go again if I had the time and the money! 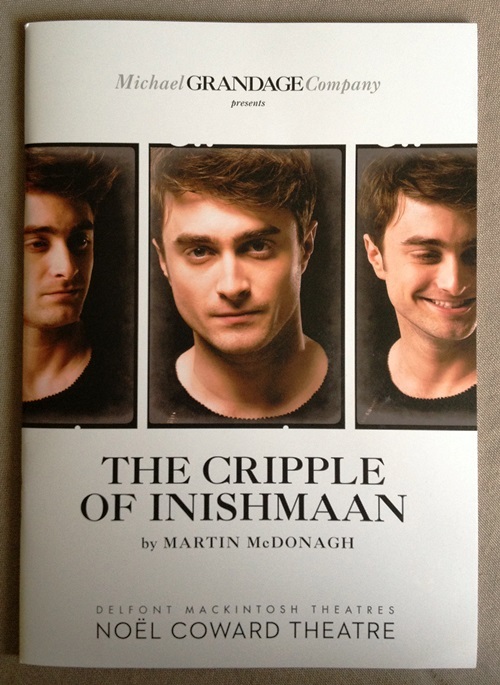 The Cripple of Inishmaan is on at the Noel Coward Theatre until 31st August and you can find out more and book tickets here.